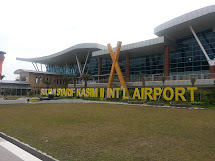 Sultan Syarif Kasim II International Airport (Indonesian: Bandar Udara Internasional Sultan Syarif Kasim II) (IATA: PKU, ICAO: WIBB), is an international airport that serves the city of Pekanbaru, Riau, Indonesia.The airport is often referred to as SSK II, SSK or Sultan Syarif Qasim II International Airport (SSQ II), and formerly known as Simpang Tiga Airport. 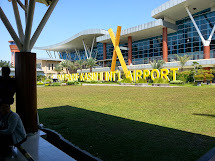 Pekanbaru-Airport is one of the smaller airports in Indonesia. It is an international airport with more than 2.7m passengers per year (incoming, outgoing and transit). The runways are located 30 hours away from Atlanta, GA and from here the shortest possible connection is a 2 Stop Over flight. Find directions, airport information and local weather for Pekanbaru airport and details of airlines that fly to and from Pekanbaru. Make use of our handy maps or videos to ensure you’ll easily find your way to Pekanbaru airport, whatever you need, Skyscanner’s got it covered. Use the links below to read detailed information about Pekanbaru airport: location, route maps, live departures and arrivals etc. Skyscanner allows you to find the cheapest flights to Pekanbaru airport without having to enter specific dates or even destinations, making it the best place to find cheap flights for your trip to Pekanbaru airport. Above you'll find some useful information about Pekanbaru's airport that can help you in planning your next trip. Expedia offers flights from PKU airport on multiple airline carriers, and makes it easy and affordable for you to book low cost Pekanbaru flights. Check out popular airlines servicing Pekanbaru (PKU), and lock down the best fare for your upcoming travel plans. Flights.com makes it simple to find flights departing from Sultan Syarif Kasim II International Airport across many airlines, so quit waiting and book your trip with us!